This giveaway is now closed. View the winner here! Andi Silverman of the blog Mama Knows Breast: Adventures in Breastfeeding was kind enough to send me a review copy of her book by the same name: Mama Knows Breast: A Beginner's Guide to Breastfeeding — as well as a second copy to give away. I'd seen this book kicking around the breastfeeding blogosphere; I'd enjoyed reading the MamaKnowsBreast.com blog; and I'd even been a fellow participant with Andi on a breastfeeding blog carnival or two. But I hadn't yet had the chance to read her book, so I up and asked her if I could review it and host a giveaway. As you might guess, she graciously said yes and fired off a package my way. My first impression of the book was, superficially, "Wow, this is really pretty!" Because it is. The paper is a nice weight, and it's the kind of book where some of the pages have their own designs and color variations, and the printing is two-color. I get a kick out of details like that (so thanks to Becky Berkheimer, the graphic designer). The line-drawing illustrations by Cindy Luu are charming and modern. The book is laid out like a guidebook, with bullet points and pull quotes, and it would be easy to glance through it or flip around to find a relevant or intriguing passage. So, admiring the prettiness was as far as I got for awhile. And then last night I had a dramatic pause that enabled me to read the book and write this review. Having read it cover to cover, I can now envision Mama Knows Breast as a perfect baby-shower gift for a new mother. It's a book about the fundamentals of breastfeeding without being overwhelming in information or rhetoric. Far from preaching to mothers that they have to breastfeed or must breastfeed for a certain length of time or should feel comfortable nursing in public, Mama Knows Breast makes it clear that all those choices are up to the mother. public, I try to keep from sounding shrill in my defense of breastfeeding. I remind myself that I don't know the story behind every woman's choice to breastfeed or not. When someone talks about not wanting to breastfeed or wanting to wean quickly, my first instinct is not, unfortunately, to be supportive. Clearly my voice is not the one someone who's waffling on the subject of breastfeeding necessarily wants to hear. I feel like there are many new mamas who would give breastfeeding a try or stick it out through initial obstacles if they could get some sisterly advice and gentle encouragement about the subject, and I feel like Andi Silverman offers just that in this book. I also love the "From the Mouths of Moms" quotes scattered throughout the book. Some of the anecdotes are tear-jerking, some funny, and some helpful. They all serve to remind you that you're not alone in this breastfeeding thing. Sinead at Breastfeeding Mums, for instance, makes an early appearance as a proud mummy at her daughter's christening whose happy mood is ruined by realizing leaking breasts are turning her lilac dress a deep purple. I felt sorry for Sinead, but boy did I snicker at that story! I've been there. Are there any cons about the book? First, it's important to keep in mind that this is "A Beginner's Guide to Breastfeeding" (emphasis mine), so if a reader needs more information on a topic, this slim volume isn't going to be comprehensive enough to answer all questions. I fully trust this was done intentionally, to keep the book readable by a new mom or mom-to-be, and I think Andi does a great job of listing quality resources in the appendix to direct readers to well-respected books and websites on breastfeeding in general as well as specific subtopics like medications, breast surgery, breast cancer, lactation consultants, and donating breast milk to milk banks. So while Mama Knows Breast might not answer every question on nursing, it guides the way to delving further into the topic once a reader's interest is piqued. I did take issue with a few aspects of the book, but I know it's my lactivist bent showing itself again. For instance, the Cons of Breastfeeding include items that would be a challenge whether breastfeeding is involved or not — warnings against sleep deprivation and the fact that now your partner will have to share your attention apply to all parents of a newborn, not just those who breastfeed. Another example that may or may not bother you, depending on your experiences, are assurances that babies can sleep through the night by a few months of age, or that their number of feedings will drop by that point. Feeding on cue often means that babies continue to night nurse and feed frequently during the day, for quite some time longer than that. There are a few other details where I've come to a different conclusion than the experts Andi consulted in writing the book, but I'll stop nitpicking because I could provide counterarguments to every objection. What I will say, simply, is it's a book that's written toward a mainstream audience. It does this job very well, and I think it's a good tool to persuade someone who's curious but anxious about breastfeeding to give it a try. It's practical, easily digestible, and a good size to hold in one hand while nursing. Witness the cover illustration to see what I mean! I know from her blog that Andi Silverman has many more opinions on and knowledge of breastfeeding than she chose to fit into this book, and that's as it should be. It's a starter guide, meant to appeal to the novice breastfeeder who might not feel comfortable with the whole idea of nursing but just needs a little encouragement and a few tips to give it a go. My theory on the perfect use for this book? guilting you. Whether you decide to breastfeed for a day or a month or a year or not at all, to supplement or pump or not, to nurse in public or keep it under wraps, Mama Knows Breast will help you navigate all the options available. If you are an old hand at breastfeeding, Mama Knows Breast is an ideal baby gift for a first-time mother. I intend to keep a copy of this book handy as part of my baby-shower gift stash. It won't offend anyone who's at all interested in trying breastfeeding and would be a great way to introduce the basics of breastfeeding to a curious new mama. You'll be an ambassador of breastfeeding! 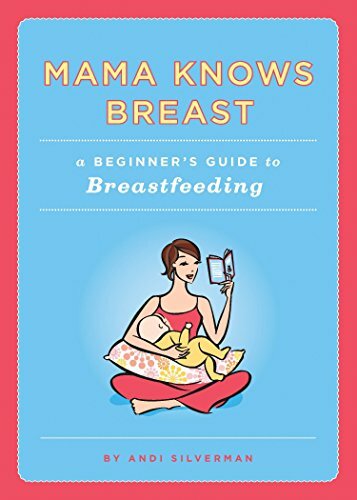 You can find Mama Knows Breast: A Beginner's Guide to Breastfeeding at your local or online bookseller. The best deal I currently see is on Amazon (affiliate link, but seriously! ), where it's on sale for $11.66 and is eligible for free Super Saver Shipping on orders over $25. For your own chance to win an autographed copy of Mama Knows Breast: A Beginner's Guide to Breastfeeding, by Andi Silverman, enter in the comments below! Contest is open worldwide because you know I love you all. MAIN ENTRY: Andi Silverman runs a wonderful breastfeeding blog also called Mama Knows Breast, where she gives current and interesting information about breastfeeding issues and advocacy. Check out any of her articles and tell me something you learned. Leave an email address in your comment if it's not clearly visible on your profile or linked web page so I can contact you if you win. Subscribe to MamaKnowsBreast.com in a reader or by email. Follow @AndiSilverman on Twitter and leave your Twitter name in the comment. Do something lovely for this post, a post on MamaKnowsBreast.com, or a post on Hobo Mama (StumbleUpon, Twitter, Facebook, Digg, Technorati, etc.) and let me know what it was and which post in your comment. 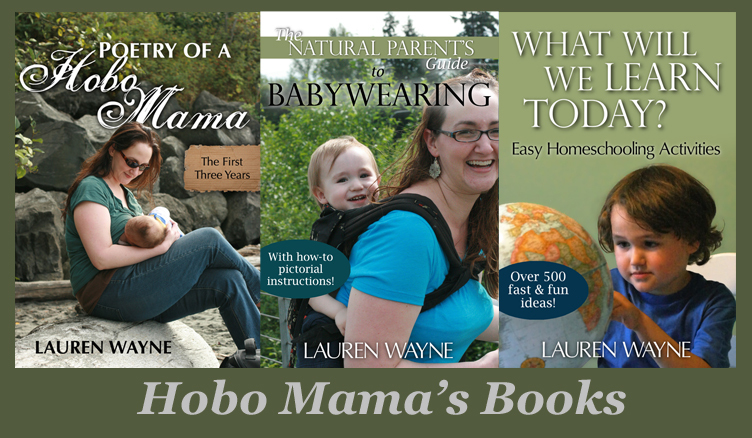 There is a Share button below each post on Hobo Mama. You can gain up to 3 entries this way. Include this giveaway in a post on your own blog for 3 extra entries. Leave the direct link in your comment. I will pick the winners through random.org after the contest closes and send an email to notify them. Leave an email address in your comment if it's not clearly visible on your profile or linked web page so that I can contact you if you win. If I can't reach any particular winner or don't hear back within a couple days, I'll draw a new name. Contest closes Feb. 25 at 11:59 p.m. PST. I learned that a new study shows that anti-depressants may delay the breast milk coming in right after birth! I learned you can donate your milk to the children in Haiti. I did not know that that using antidepressants can delay breast milk coming in just after birth. It makes sense but I never had heard of that before! I didn't know that they needed donors for Haiti. Thanks for the giveaway. I learned that in 2006, 74% of American mothers tried breast-feeding their newborns. We'd love a chance to win this one. Thanks! Sorry, I didn't read the instructions properly - you wanted us to mention e-mail addresses specifically in the comment, didn't you? Mine is nannyogg at samael dot demon dot co dot uk. Thanks! I learned that using antidepressants can delay breast milk coming in just after birth according to a recent study. I can't believe I missed this.. awesome book I am reading all about BF atm... Looking for it anyway.